TIFFANY & CO PRESENT CHARM | Beverly's Net: family. food. fashion. TIFFANY & CO PRESENT CHARM – Beverly's Net: family. food. fashion. This was a wee little birthday gift from myself to… errrr…. myself 😛 A Tiffany & Co present charm!! I like how wee and little it is, and in my favourite colour to boot 🙂 Works as a necklace pendant, bracelet charm, or bag charm. At the moment I’m using it as a mobile phone charm though, so I can see it and coo at it every time I whip out my phone, haha. Previous BIRTHDAY PARTY AT HoF! 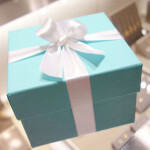 I wish I had used Tiffany blue as part of my wedding color scheme. Love it. And the charm is adorable! Definitely a ‘statement’ piece. Its sho cute! Thanks hon, ya I coudln’t resist when it’s so freakin’ cute! I agree! Love the colour.. 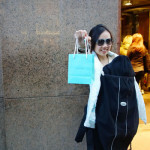 I didn’t know that was called Tiffany blue – it’s a lovely colour. phone itself totaly no spots! unless you put it on a protective casing and try to hang it off it! A present from yourself is BEST – you’ll definitely like it! Very pretty! It’s pretty secure on your phone? Wouldn’t want to lose that! Yep, the BB has phone charms clasped on really well, fortunately! Oooo… so cute. I like. there’s always space for pressies from yourself to yourself. heh. And great peektures help too! It’s cos we’re both shopaholics I think, heh!! My lovely Sis bought me that gorgeous charm, together with the horse shoe and necklace. I LOVE IT! Enjoy yours! Aww that’s so lovely of her, lucky you! Goshh, it’s just too cute!! –> And I don’t even use that statement a lot! Haha. Ive wanted this for so long!! the husb bought me this for last year’s V-day! or was it the year before? hmm, darn pregnancy forgetfulness. It’s my favourite colour too! Have it on my nails right now. Pretty! I like how it’s so tiny and adorable that way! heh yeah, stuff like that always gets me!